Celebrate Valentine’s Day in Ripley this year. Make sure you spend Thursday, 14th February with your loved on at the Toby Cottage. Our specially created three course menu is available for just £45.50 per person. The menu is made using only the finest seasonal produce available and contains delicious dishes such as braised monkfish wrapped in pancetta or a tender roast of pork with black pudding mash, buttered red cabbage and a peppercorn sauce. Call us now on 01483 224225 to book your table and experience our romantic 16th century oak-beamed interior. 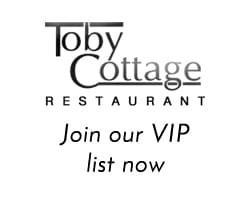 Here at Toby Cottage we are pleased to announce our new Winter Set Menu. This is available for either lunch or dinner, except Saturday evenings, with three courses available for just £19.50 per person. The menu is also available as a two course luncheon for just £15.00 per person.